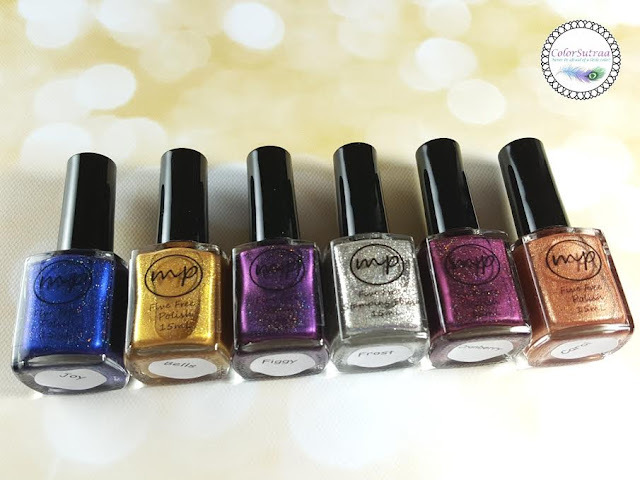 Bright and early this morning, I'd like to introduce you to Megan and her fabulous brand, M Polishes! You know, it's always irked me that there's such a lack of good, affordable stamping polishes available on the market in the US. I mean, I really don't want to wait 2 months to get a shipment in from Mexico or pay an arm and a leg for my nail art whims. And that's exactly why I'm so excited about this week's featured indie series! Megan reached out to me when I last sent out a call for new indies for my feature and we decided to set something up for the Holidays. Since then, she's been an absolute joy to work with! Her enthusiasm surpasses even mine and she insisted on doing it big for the Holidays--I quote "It's the holidays, so let's spread some cheer". It's this kinda attitude that's won my heart! Not to mention that I ABSOLUTELY adore her holo stamping polish, To Have and To Holo! So here we are, my darlings! Enter below for your chance to win one of the two prizes pictured below! Plus, if you follow us on Instagram (HERE and HERE) you have ANOTHER chance to win! THREE winners total! Good luck, my darlings! The most popular color I use is black. I tend to use a matte black from Chaotic Glitz since I haven't had much luck with others. Probably user error but I'm still trying to learn. I tried stamping once. It was a red polish. It didn't come out so well, but I am going to keep playing with them. I love stamping. My favorite used to be Mentality and Mundo De Unas. We all know what happened with Mentality so they are not being used anymore. And I can't stand the smell of the MdU so I don't use them either anymore. Right now my favorites are MoYou Londons stamping polishes. But I have heard lots of positiv about these so I would love to try them. I tried once with black. I use blue and red. I tried it once and the results weren't that good. Duh! I need practice. I used white, it showed up pretty well. Ces vernis de stamping ont l'air si beaux !!! j'aimerais beaucoup les tester alors je tente ma chance. These stamping varnish look so beautiful !!! I would love to test so I try my luck . Je stampe souvent et la couleur que j'utilise le plus souvent est argenté. I often stampe and color that I use most often is silver . Ilove stamping, dont own any stamping polish tho. I just stamp with regular polish, love using metallics. So far, my favorite color I've stamped with is M Polishes Frost!